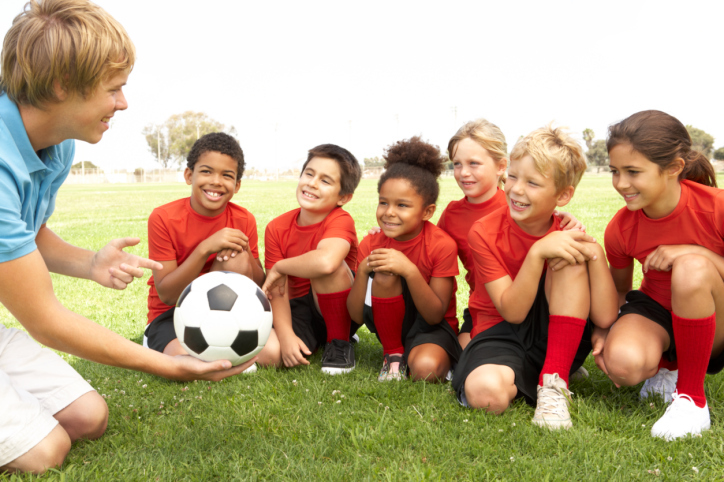 As athletes grow older and out of the ranks of high school and college sports, many turn to younger teams and begin coaching - sometimes for fun and sometimes as an occupation. For some, coaching comes through other natural connections, becoming the parents who coach their son or daughter's team. Coaching, whether it's out of a desire to stay involved with sports or because your children need a team leader, can be a wonderful opportunity to mentor students and to be involved in your community. For several hours a week through practices and games, these young athletes are in a coach's care. A coach is there to give instruction on the sport, help the athletes hone their skills, and in the best of cases, be a role model and mentor to the athletes. An acquaintance of mine, Emily, loves to play soccer and has since she was a young girl. She played on her high school team and on numerous club teams and did quite well. When she went to college, she played on intramural teams for fun. Once she graduated, she served as a Journeyman with the International Mission Board in Central Asia. Emily was very intentional about building relationships there with people so that she could share about her love for Jesus. Though she used teaching as her primary way to meet people rather than soccer games, soccer still remained a love of hers. When she returned from Central Asia to live in Louisiana, she looked for ways to connect with people and pour God's love on them. A soccer connection opened up and she had the opportunity to begin coaching a youth girls' club soccer team. She jumped on the opportunity, knowing that this would give her the opportunity to be involved in soccer again and be connected with girls in her community who come from many different backgrounds. Each week, Emily spent several afternoons coaching the girls at practice and in games, getting to know them as well as helping them improve their teamwork and skills. As time went by, the girls began to trust her where she had the opportunity to speak to them about school, grades, relationships, family issues and Jesus. She was able to connect with the girls through a common soccer focus but then have an impact on more than just their soccer skills. And this can happen with any coach. Coaches are in a valuable position to challenge their athletes and point them to a better way in life. As athletes experience frustration in the game or conflict with other teammates, there are teaching moments that appear, where you as the coach get to demonstrate the love of Christ and pour godly wisdom and direction into these athletes' lives. To be sure, it's not always going to be a rosy situation - pouring into kids and youth can be tough at times. But what an amazing position you are in when you coach. You naturally are in a position of respect as the coach and you can use this to help them improve in their sports skills but also to point them to the God who loves them and has big plans for them. As Christ followers, we are told to go and make disciples, baptizing them and teaching them in the way they should go. The going part means to put ourselves out in a place where there are people who don't know Christ or who don't know how to mature in faith in Him. When we meet these people, we walk through life with them, have conversations and look for opportunities to help them understand God's grace and help them come to a point where they are ready to surrender to Christ and be obedient to his way (baptism and discipleship). Sports and coaching is a great way for the Great Commission to happen. So go enjoy sports and see this as God's given way to connect you with some athletes and families you can love on. Consider coaching a team this year so that you can meet people outside your church group and love on some kids in the process. You never know what God will do through your willingness to serve in this way. Don't feel like you have to be an expert at the sport. Many programs like Upwards Basketball and YMCA teams will walk you through the process of coaching. More than anything, they just need adults willing to use sports as a way to invest in children in their community. And that's something that many of you can do. Go enjoy coaching! Be like Emily and take a sport you love and turn it into a way you can invest in the next generation and share the hope of Christ. Have fun and ooze the love of Jesus in the process so that His name will be made know on the soccer or baseball field.